Any system exists within an environment, both outer and inner and has to change in harmony with it. As the environment changes, the system has to change accordingly, if it wants to survive within the changed environment. Hence the environment is regarded as a force of organisation. One can distinguish an outer and inner environment. 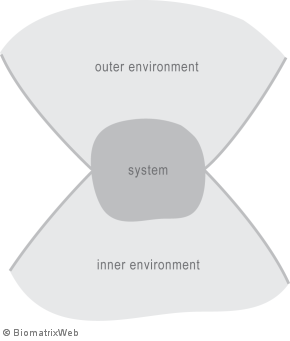 The concept of the outer environment is well established in General Systems Theory, that of the inner environment is not. Many systems thinkers regard everything that seems to be within a system as being part of it. 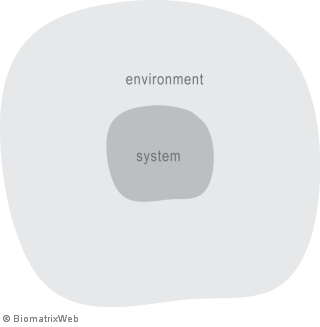 By comparison, Biomatrix theory distinguishes between parts of a system and an inner environment of the system. The parts of a system are inherent to the system. They exist as long as the system exists. They can refer to functions, function related structures, cross-functional structures, emergent structures. The inner environment of a system is populated by entity systems which occupy it and render a service to it (such as the cells in a body or the persons in an organisation populating the functions and structures). Not all entity systems in the inner environment are necessarily desirable for the containing entity system. Examples are a virus in the body, a corrupt person in an organisation and terrorists in society. The entity systems in the inner environment are typically replaced frequently during the lifespan of the containing system. For example, the cells in the body and the staff in the organisation come and go, while the functions they occupy and which belong to the containing entity system remain. The inner environment mirrors the outer environment, analogous to the crown and roots of a tree. Many organisations emphasise the outer environment while neglecting the inner environment (e.g. during environmental scanning and strategic planning). Yet both environments are equally important to the development of the organisation.